There is nothing like it in all of Clayton. A full line distributor of vinyl products right on Main Street in Clayton. Johnston County is the fastest growing county in North Carolina. 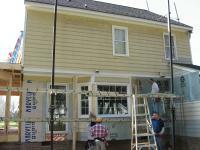 Olde Town Supply has a large stock of vinyl siding squares ready for you to do your next project. 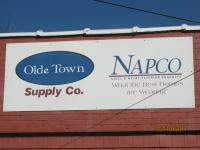 Napco offers a life time warranty to insure long lasting quality. They have various colors and styles to choose from. The most popular styles, Dutchlap and Clap-Board, are in stock. The popular wood-shake like product is displayed in various colors. The straight half-round shapes add a distinct look as a accent or for the entire project. Other vinyl products such as railing and fencing are in stock and on display for you to preview before ordering. Privacy fence, picket fence and split rail fence can be priced according to your specifications.